Friday was a good day. 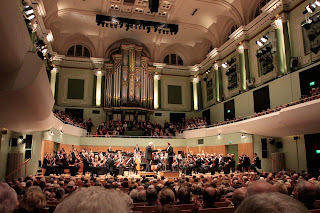 To top it all, we brought Sam to see the RTE Symphony Orchestra at the National Concert Hall in Dublin in the evening. Sam is twelve and loves his music so we figured a chance for him to see the full-whack orchestra going full tilt was too good to pass up. As for us, maybe we would enjoy it a bit too. At least it would be “something different’, you know? Well this… I simply loved. 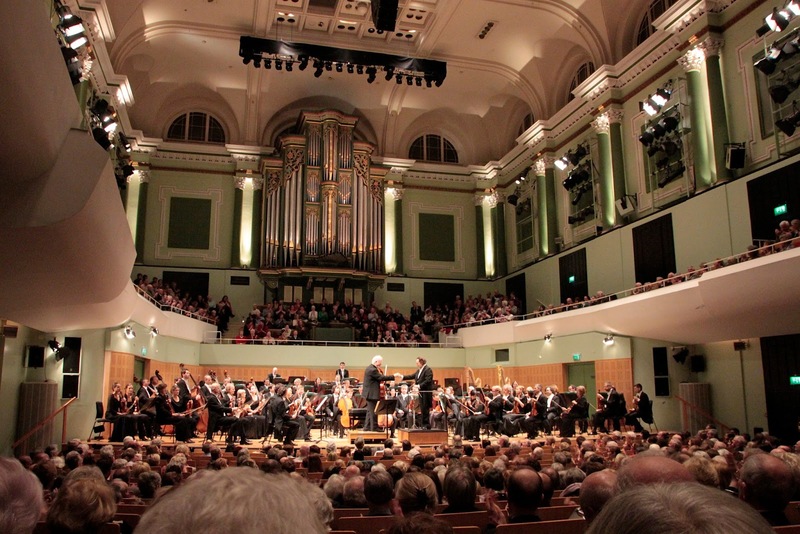 I hadn’t been to the National Concert Hall in Dublin since I was in college there and that, as we have long-ascertained, ain’t today or yesterday. It’s a very lovely place. That very first glimpse of the performance space through a slender glazed panel gave me a great buzz of anticipation. We heard Dvorák’s Carnival Overture, Op. 92 [10'], Tchaikovsky’s Violin Concerto in D, Op. 35 [33'] and the Saint-Saëns Symphony No. 3 in C minor, Op. 78 'Organ Symphony' [36'] or, as the last one is better known ‘If I Had Words to Make a Day For You’ as used in ‘Babe’. This latter meant that the wonderful organ in the Concert Hall was giving a welcome airing (see what I did there?) and very impressive it sounded too. Ilya Gringolts was the violin soloist on the Tchaikovsky centrepiece and I am in no way equipped to comment on what he did beyond saying that he blew me away with the passion he wreaked from the music. Hannu Lintu was the personification of my romantic idea of a Conductor. Tall and chisel-featured, commandeering and elegantly cow’s-licked, he seemed to offer me a greater understanding than ever before of the (to me) somewhat mysterious subtleties of the conductor’s work. For me, it didn’t seem so much like we were in a theatre as in a studio. The stage was set low and the generous seats were gathered right-up-close to the orchestra. Little things like the microphones dangling precariously from wires from the enormous ceilings added to a feeling. It was the feeling that we were not just here to hear a show. It was as if we had all gathered here to make some Art and that we, the audience, were also a precious part of that, not just here to witness but to partake with our live-presence, our carefully withheld applause and even our breathing or occasional subdued cough. It was like some piece of Art existed only on flat parchment and we had gathered here to add life to it, to make it soar at least one more time. How can anyone be bored at such a performance? There is so much to see, so much to hear. The orchestra exuded pleasure in the work they were about and that pleasure pervaded the hall almost as much as the notes themselves. And the sound. Oh the sound. Not ‘loud’ per se, not an assault on the senses. Rather a deep sonorous, soul touching immediacy that cannot be matched outside of that room. I’ve never been one for drugs but, when I came out again onto the damp streets of Dublin after it was all over, I fancied I felt a little like one much feel when the very best of drugs are in play. It was Friday evening and the world seemed slightly more elegant and bright and full of possibilities. It seemed a little better, you know? It’s Sunday morning now and the feeling has pretty much gone again. Only the memory of it remains. I miss it. I know I will try to seek out an opportunity to do it all again as soon as I can. To those who won’t get this, I guess this will sound pretentious and a-bit-arty and ‘up-its-own-arse’ but what can I tell you? All we can do is like what we like. I realise I’m not talking about my wife or son’s reaction to the evening. They had a great time too but I don’t think I’m equipped to say very much more on their behalf. It’s certainly a communal experience, I guess, the Symphony Orchestra, but it’s very much a private one too. When the playing begins, there is very little left to stand between you and the music. It’s your thing. Just you and the orchestra and the music. Oh, look, can I just go back again soon? I’ve not been to many live concerts, so few that I do remember most of them. The first was with the school, a performance of Gershwin’s Rhapsody in Blue and I was blown away by it. Even the sceptics who were only there for the afternoon off were impressed. For all the music I’ve listened to over the years—seriously I couldn’t begin to calculate the number of symphonies and concerti but we’re talking hundreds; there’ll be hardly a major composer whose major works I’ve not heard—there is nothing like sitting in a concert hall: the sheer power of a live orchestra is something else. The same goes for live theatre I’m sure you’ll agree and, again, I’ve seen far fewer live plays than I would’ve liked to and I will never understand why people don’t record more of these. I think it’s criminal for performances like these not to be preserved. At least with the music I have CDs and a decent sound system but what about all these great performances (like Robin Williams and Steve Martin in Waiting for Godot) that only a handful ever got to see? Okay, so I’m damn sure theirs wasn’t a definitive performance but I would still love to have seen it. Oh, I'm so jealous. I've been aching for about three years now to see/hear Saint-Saens Organ Symphony No. 3. There really is nothing like an orchestra in full swing. Even concert bands and brass bands can't match it, it's just an experience of its own. Lovely enthusiasm, Ken! A joy to read. When someone asked me recently why I still liked the music of my Dad's era my reply was, "I miss the sound of an orchestra swelling in the background." Nothing like catching it live, eh? Posts like this *almost* make me want to go back to playing again.